My first semester at Kenyon was an adjustment. Yes, my classes were engaging. Yes, my professors were invested and passionate. And yes, the little campus up on a hill was just as beautiful as I had expected it to be. But there was something missing. I struggled to find my place within the Kenyon social sphere, continuously searching for some sort of community or group that I could truly be myself in. Greek life had never crossed my mind too much before coming to Kenyon, with my only knowledge of it being that my student admissions host from fall weekend was in a sorority. Sororities and fraternities had always had a bit of a negative connotation in my mind, with fear of being an outcast never allowing me to fully consider it. The end of first semester came around, with emails from Greek Council encouraging students to sign up for Recruitment. On a whim, I went for it. Maybe Greek life at Kenyon would be different than I thought it would be, and maybe I would finally fill that open gap in my life. I can easily say that going Kenyon Greek was one of the best decisions I’ve ever made. From the very beginning of Recruitment Week, I found myself continuously drawn to one specific group of amazing, dynamic and passionate women who genuinely seemed to like me for me. Just as when I first set foot on Kenyon’s campus, something about Epsilon Delta Mu just clicked. Since then, my sorority has become my family in every single sense of the word. They pick me up when I fall down (literally), carry my 7-foot-rug all the way down Middle Path on move-in day, ride in the ambulance with me when I have an asthma attack, and listen attentively when I go on and on about whichever English class I’m currently taking. 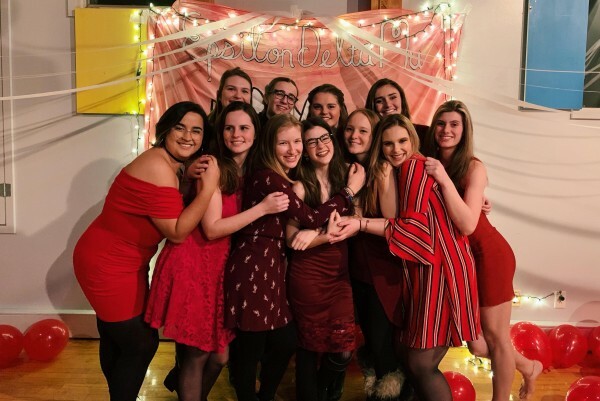 Whether it’s laughing at me as I bring jars of pickles to mixers for a bit of late night snacking with my friends, Golden Girls marathons on snow days, or always having a group to eat a meal with at Peirce, my sisters support and love me unconditionally, and that is something I am forever grateful for. So, new members, get excited! You’re about to embark on one of the best times of your life. If you went Greek for more friends, a support group, or even just to meet new people, I can assure you that it is a choice you won’t regret. Get ready for an influx of Greek alumni cheering you on from all over the world, and a constant stream of love and support from your new family. We are all so excited to have you join us.